This is the first of the two Intermediate Courses we offer. The PDC+ is the basic Integral Permaculture Design Certificate, it includes the regular PDC but goes into a lot more depth (with 30 extra classes) on some topics which we think are essential for good project management. This Integral Permaculture Certificate, includes more support & direction to help you focus on the application of the principles to your life & projects. This program is ideal for people who have already started studying or doing Permaculture, whether formally or informally, and want to move & improve their practical projects with good design support, and keep learning with practice. It is ideal if you have taken a regular PDC & want to deepen your understanding & practice of this important design science. It is the minimum level of support we advise for anyone participating in a Transition Initiative or other important sustainability project. & also try & see if this type of action-learning works well for them. Or the Integral Permaculture Certificate, includes more support & direction to help you focus on the application of the principles to your life & projects. in order to take full advantage of the rich contents of this course, which are assimilated much better the more we relate to them, through dialogue & in relationship with your experience & that of others. The dialogues are important in that we can catch whether you've really understood a new model given in the classes, or whether it has just fitted into the old ways of thinking (more common than we like to realize) ... but of course this depends on how much you decide to share about your understanding! This below is the programme of the theory part of the course, which we will expect to see reflected in the practical work which will consists of a minimum of 2 designs: a personal and a group design (or project). It is most useful to embark on the course with an idea of what project you wish to move forward for yourself and your group, but you can also decide once you've started, with our help, if you don't have any clear ideas about this yet. People Care is one of the 3 ethical bases of PermaCulture ... but how do we put this into practice? People are, as well as the context, without doubt also the most difficult aspect when it comes to realising truly sustainable projects. "The greatest challenges for humanity are not hunger, poverty, peace, public health, education, the economy, natural resources, nor a combination of these or other issues ... but our capacity to build new social organizations capable of providing the solutions. Our greatest challenge is collective intelligence." 1) Why are we (as humans) so slow in learning about Sustainability? Here we will delve into the issues of thinking in a systemic way, Action Learning, how to study more effectively & we look at really understanding what Sustainability is. 2) What are the Basis of Permaculture Design? Here we explore for the first time the Design Ethics, Directives & Principles & we place them in the wider context of Permaculture. 3) How do Groups function? & why do they fail so often? In this class we study the cycles & natural successions of groups, some growth patterns of teams & we look at the most common errors. We present some examples of designs for support structures that are very effective in practice. 4) Which Communities work & what do they do differently from those that don't work? We look at what are EcoVillages, what other types of communities exist & we explore a little the design of communities, criteria & patterns for success. 5) What is Collective Intelligence? & can we design for increasing it? 6) What are 'Models' & why are they so important for Permaculture Designers? In this class we study the basic nature of the Scientific Method & it's problems, taking as an example of our difficulties in changing paradigms a rEvolutionary model of the human mind. 7) What makes some people very effective at realizing their dreams whilst other people struggle? In this class we investigate how to increase individual intelligence, how it inter-connects with emotional intelligence, the habits of highly effective people & some ingenious tools for thinking & co-creating in powerful ways with others. 8) What is the Integral Model & how does it work? Why is it so significant for this time in history? If we do not understand the mechanics of current systems & especially its self-regulating (or self-defence) systems, we can hardly expect to change it: in fact it is possible that we will simply keep reproducing the basic patterns with some new external appearance. We continue investigating some interesting (& for many, counter-intuitive) models that - from very different directions, profoundly question our habitual understanding of this 'system'. PermaCulture is based in understanding the process of a good design in order to use this in a more conscious, effective & powerful way. We are all designers, but what characterizes a notable design or designer? What works? In this module we study the criteria of functional design & the true meaning & the conditions of the design of integrated ecological systems. Permaculture has quite particular ways of thinking about design, about resources, human interventions in the system & of integrating the social aspects with the physical, energy aspect & the abstract. We learn to look & think in a new & different way. 1) What is Design? & Can we Re-Design a whole Society? Permaculture is a holistic science based in design & that is not something easy to understand in a society where we are taught (mostly) to follow recipes & copy things, or consume instead of truly create & think for our selves. In this class we explore why learning to design, from first principles (which we always question) is so vitally important, & we look at what design is all about & how it can be applied at every scale. 2) What kind of maps and graphic representation do we have available to design with? Although “the map is not the territory” the more accurate and appropriate are the maps we use, the easier it is for us to know where we are at any particular time, & where do we wish to go. So learning how to make and use maps + various kinds of graphical representation of information ... is a key skill for permaculture designers. 3) What are our real motivations behind our designs? 4) What design structures do we have available & how do we use them? 5) How do we ensure Optimal Resource Use & best Choice of Materials, Interventions & Technologies? This is something so basic that it is quite common to fall into old habits, simply copy what others have done or (even worse) use the materials 'we like', those we are familiar with, or technologies we find pleasant instead of those which do, in fact, best fit the criteria of sustainability. In this class we look at the importance & thinking behind the hierarchy of resources & the scale of interventions, two tools amongst various which we use to ground our designs. 6) What does observing consist of? & Why are we so bad at it? Observation is fundamental to any design & goes far beyond looking at something carefully. We involve all of our communication channels in a systemic & sistematic way, in good prolonged observation.We involve all of our communication channels in a systemic & sistematic way, in good prolonged observation. In this class we study in depth the clients interview & other observation techniques & tools. 7) How do we apply the fundamental principles to Permaculture Design? It is easy to design if we are clear about the design principles, but much more difficult to really understand & integrate these principles in our practice. In this class we go into more depth about the design principles, with lots of examples of each in order to understand them better. 8) How do we clarify Design Aims & Criteria & Evaluate effectively? Design is a continuous process, so being able to see whether a project is moving in the right direction & accurately evaluating progress, so being able & ready to re-direct resources & efforts in order to respond creatively to surrounding co-designs & changing circumstances ... is an essential part of the whole. In this class we look at how to develop these crucial skills & explore some of the tools we use for creating flexibly with complex & ever-changing Life forces. There are a great number of design methods & it is important to choose those that are best suited to your particular circumstances & objectives. In this class we look at some of those methods & talk about the criteria to take into account for their use. Here we continue deepening on the various methods of design and their use, with more examples. See above. Permaculture started as "Permanent Agriculture" & although very soon we realized that an ecological agriculture cannot work longer-term inside an exploitative economy or an un-just society (we need to design systems that integrate it all), the bio/ecological aspect of permaculture keeps being of central importance. Not only because there are great design lessons in all natural systems (it's advisable to study them in great depth), nor because it's the historical origin of Permaculture (and perhaps the most develop facet), but also because it's a level on which we can act most easily, changing our economy in an immediate form, & where we most easily learn the lessons of nature &, on the way, also of connexion and self-esteem. and from a gardener naturally grows a philosopher." We could say that the destructo-culture, based on industrialized agriculture, carries a basic dysfunction, which is to see the soil as an inanimate thing, a resource to be exploited, & even something that can be seen as 'property' of human beings. This paradigm has to change because it is at the base of great injustices & of the destruction of the most important base for life on Earth. In this class we meet the soil as a living being, an organism of enormous complexity & importance, studying how it works in detail, from the microscopic to the global level. To know soil intimately is fundamental for any sustainable design & to have a direct & vital relationship with this great organism helps us re-connect, physically as well as emotionally, with the Planet. 2) How can we Regenerate Soils? Fertile soils are very important stores of carbon in the earth, & just with regenerating soils we could halt climate change stabilizing the concentration of CO2 in the atmosphere. It is vital for sustainability that we regenerate & improve the fertility of soils also because they are the support of biodiversity, important stores of water & indeed the base of all land-dwelling life & any civilization. 3) What are the Vital Cycles? Gaia, the great living organism that is Earth, can be understood as a whole made out of millions of vital cycles that interrelate, each one continuously transforming & cycling the elements essential for Life (like oxygen, carbon, nitrogen, etc.) in order for these to be usable in their optimal form for each organism that needs them. It is our great ignorance of these cycles, & of their vital importance for the equilibrium of the whole system, that has brought us to making great design errors, as humanity & as individuals. In this class we get up to date with an essential aspect of the functioning of our home, the Living Planet & we get familiar with the most fundamental blocks that support the whole of Life. 4) How to manage Water in the Landscape? 5) How does Aquaculture work? Normally we think of producing food or biomass with terraculture (growing in earth), but aquaculture (growing in water) can be many times more productive for the same surface area. Therefore knowing how Aquaculture works is important if we want to create super-productive systems. In this class we explore the basic principles & various good examples of very productive aquaculture (& multifunctional) in different parts of the world. Also we explore how we can start very small in order to add mini-aquaculture-systems which are very easy to install & maintain, in our surroundings. 6) How to Integrate Animals in a System? In natural systems plants & animals form a single system, where all organisms are closely inter-connected, & give each other mutual support. But normally in systems that we humans have designed, animals are excluded or separated from their vital environment, so creating not only waste & pollution but also terrible conditions for animals & their exploitation. In this class we explore how to learn from nature & design systems that re-weave the whole web of Life, so creating environments which are ideal for plants, animals & humans, as well as giving much greater abundance of well-being, richness & also production. To return the control of food to each local community is something essential to creating sustainable societies. Only installing this practice as habitual would change other systems a lot, amongst them the economy, soil regeneration & ecosystem & human health. In this class we explore the importance of food sovereignty & how it works in practice. Included in this class is an exploration in some detail in the various organic food-growing styles that can be used, in small & large scale, with examples of good practice in different areas of the planet. 8) How to Increase Biodiversity? Biodiversity is the variety of life in all its forms, levels & combinations. To maintain the biodiversity of the Gaian organism is of vital importance because each species represents a node of connexion in the complex web of Life which sustains us. At the moment our industrial & highly consumerist civilization is responsible for the disappearance of some 200 species per day. These are converted into human biomass on a daily basis, but we're destroying the foundation that support our own survival. So there is a big job to do. In this class we explore some direct ways of increasing biodiversity at a local level, like seed recuperation, habitat protection, & starting to change our diet in a conscious way so that it adapts better to the indigenous ecosystem of our region, instead of trying to adapt nature to our whims. ¿Why are trees so important? If we all plant some 10,0000 trees each we can prevent climate catastrophe, regenerate lost soils, increase biodiversity and preserve vital ecosystems & cycles. Trees are the biggest and oldest living beings on Earth. But around 75% of the ancient forest have vanished due to human action. So it's urgent for us to know and understand trees, how to plant them, how to care for them,how to return them to their most important place in nature. In this class we will learn about tree biology and tree functions as well as their influence in our culture. At about the time humankind discovered agriculture, forests covered about 50% of the land area on planet Earth. Now they barely cover some 30%, & falling. This is now the single most urgent physical repairing of the environment we need to engage in, as forests are so vital for every aspect of life on Earth, safeguarding the vital cycles of air, water, earth, stabilizing the local & global climate, creating soil & habitats for a huge number of species, sustaining entire economies & our health. Forests play a key vital role on many levels as they are so basic & even primal for humans. In this class we get intimately acquainted with Forests, their make-up, how they work & especially we learn how to design Forest Gardens: our future human habitat, if we are to survive & thrive as humans. Despite the fact that many 'Technological Improvements' haven't managed to improve the quality of life for the majority of people, but have brought more problems & pollution, we still keep expecting the arrival of a more modern technology, perhaps more ecological, that will restore & reverse the damage made. In fact, it is possible, but not without having more citizens with a better understanding & a wider vision of what technology is, & who also understand some basic science necessary in order to be able to think for ourselves on these subjects. The technology of the home, or bio-construction, is a close & important example for all of us, which will be highlighted during the course. 1) Is our Civilization Collapsing? Climate Change, Petrol Peak & Economic Crisis have been called the 3Es of Collapse: Environmental, Energetic & Economic. It is important to be well informed about the basic facts & science of these, how they interconnect, their causes & predictable effects. In this class we look at these issues in some detail, also exploring what cultural & inner meanings are being proposed & that we can make of these crises / opportunities. What does all this mean for us as integral designers for sustainability? 2) How can we make optimum use of resources? 3) What are the fundamental Energy Laws? There are some basic energy laws the ignorance of which lead us to make very big & avoidable mistakes, as global as peak oil or as individual as believing our salvation will come from 'free energy'. Not understanding the basic laws that govern energy also lead us to staying permanently confused & therefore open to being manipulated with regards to any new technology or 'new miracle fuel' that is proposed. No progress can be made in terms of future energy choices if the majority of the population cannot distinguish myth from science in these important areas, and in this class we aim to firmly lay the foundations for understanding energy, which are also the foundation of any good sustainable design. 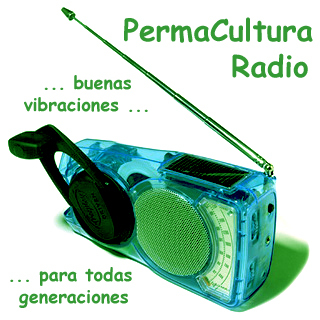 4) Why Howard T. Odum as the father of Integral Permaculture? Howard T. Odum studied in great detail the energy flows & interactions in complex life systems, creating a simple pattern-language that serves as a powerful model for understanding how ecosystems work, in useful detail. This model includes visible as well as invisible components of a system, & is so holistic that human economy as well as minerals & weather processes can be accounted for. He also proposed a new & provocative law of thermodynamics that includes Life. In this class we will explore the basics of this work and explore how it is an essential base of Integral Permaculture. 5) Why Dana Meadows as the mother of Integral Permaculture? 6) What Energy Sources are available & how do they work? Civilizations are based on the fuels they use to power themselves. The fuel determines the technologies used, and the technologies determine the lifestyles, economies, and eventually the entire culture. So the transition to sustainable fuels is critical if we wish to design sustainable cultures. This class explores which fuels can be considered 'renewable' & under which circumstances. Also we look into the various transformer technologies which are needed to make this energy available to us, how they are most effectively used and we explore what a truly 'solar-powered civilization' might look like. 7) What is BioConstruction & how many types are there? This class provides a solid introduction of the science & technology of the home, covering bio-climactic principles as well as choice of materials, location & design context. But we also question the great emphasis which is put on more & larger construction by the alternative movement these days. BioConstruction or EcoBuilding are terms which technically mean 'construction which promotes life' or 'ecological building', not something which is centered - yet again - on consumerist values: putting human whims & comfort above all else. How or when are these 'bio' & 'construction' terms used in contradictory ways? Do we need to coin a new 'perma-construction' term? 8) Why is Social Capital key for the future? In this class we explore social capital as the umbrella term we use to value a complex set of inner quadrant qualities such as creativity, innovation, social skills, connectivity, emotional intelligence, knowledge, wisdom, cultural awareness, etc., all of which have a critical part to play in re-designing any technology & therefore society as a whole. "Sustainable Development" has been criticized as a term for being inherently contradictory, but when all quadrants are taken into account, we can see that a major growth in the interior quadrants (personal development & culture) will probably be key in achieving any significant reduction in physical consumption or material growth, so 'sustainable development' is far from contradictory as a term. So how do we design for increasing and improving social capital? In this second part of exploring technology as the application of science, we delve into the basic science of fluids, of pathogens & of basic mechanics & vectors in order to become better designers of water systems, compost toilets & any built structures, large or small. NOTE THAT ... we go adding more detail about each class as we arrive at the module in the 2011-2012 programme, & adding the links to the classes as we record them. The part that maybe we least understand & least think we can change in our world, is the economy. But, infact, the majority of us are actively supporting & voting for, each day, for an un-sustainable & unjust economic system. The central message of Permaculture tells us that it is possible that each of us stops doing that and collaborate, together with colleagues across the planet, to build the alternatives. This course supplies the information, tools & the basic support for this, starting (Permaculture principle) very small, from your own home, your work & social environment as a way of influencing the global. Like all of our courses it is an Action-Learning program which means your real-life designs will be the focus of our work together & it is based in the Permaculture Designers Manual with important additions from the Integral Sciences. NodoEspiral of the Permaculture Academy is co-creating a great online e-book of resources & materials which follows the structure of the classes of the Integral Permaculture courses that we offer, expanding the information. Taking the online version of the courses means that you do the practical aspects directly in your home & your projects, in your own time, with the support of tutors & colleagues online, & this time we consider appropriate for completing the program without rushing. If you wish of course you may complete the classes & design assignments in less time. You can do a more intensive version of this course also in one month but with a rhythm of 4hrs of practical work + 2 hours of study, 5 days per week. It is recommended to do this version in a place where you don't have other distractions, & you can focus mainly on the course. If you don't have a place we can help you find it. You can see details of this option in the GaiaSis Intensive Practicals page. 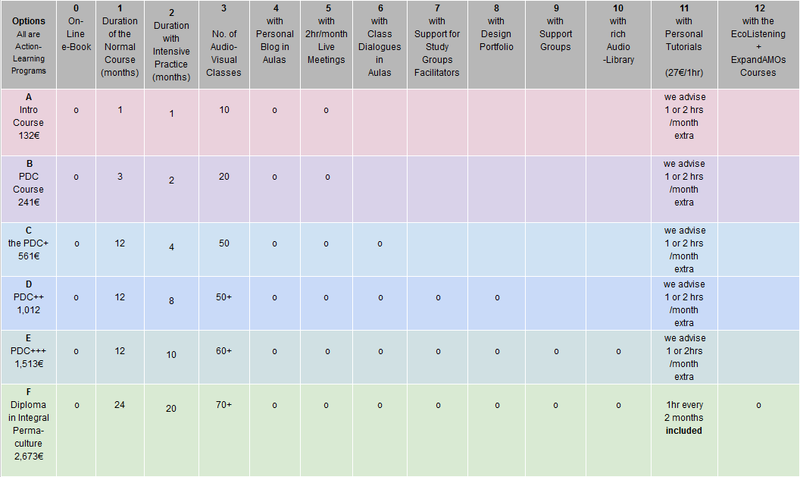 which are all the basic classes of the full curriculum. The classes have a duration of 1:30h to 2:30h which you can see at your own pace (you can stop and resume the recording at any point). The first class teaches how to listen to the others in the most effective way possible. Each class focuses on the essential points of the theory & the majority contain original materials which have not been published yet. Each student can reflect on their path & designs, sharing their learning process & interacting with the other students. It is a great start for a future design portfolio if you wish to go on with the diploma, & an essential discipline in order to integrate what is taught in class with your practice. We emphasize that dialogue & exchange of experiences is one of the most powerful tools of action learning. with the tutors, where you can put questions, present your designs & share live with the other course members. Action Learning has no beginning & no end. It's a continuous process and so this is how we've designed this programme: we'll meet you exactly where you are, any time you decide to join. You just need to take into consideration that we will accompany you for the time agreed for the course you choose, from the time you join. This course very flexible, designed to adapt around your life, not vice-versa. you have the programme of the theory part of the course, which will be reflected in the practical work, which consists in proposed activities + a minimum of two designs: a personal one and a group design (or project). Don't worry if you don't have any projects in mind that you'd like to develop as designs throughout the course - and also don't worry if you feel you have too many. Permaculture is primarily about DESIGN: and learning how to design well with anything. These are some basic text-books that we reccomend and that will be referred to during the course. You don't need any previous knowledge but if you wish, a preparation for the course is take advantage of the free online conferences that are offered as an introduction to this course, which were given live from november to march 2011 & are now (mostly) recordings you can watch at any time. As soon as you enroll you can start discussing the contents of these in more depth with others if you wish, as we will help you set up your Personal Learning Environment and pointing you in the direction of whatever aspects most interest you. This is a pattern that will continue during the course also: we aim to follow each person very personally, encourage inter-student interaction and suggest the study materials that are most appropiate for your own personal interests, level and stage. Much (but not all) can be found in internet nowadays, & we can direct you straight to the treasures and help you avoid the massive confusion & a great deal of mis-information or "woffle" that is undistinguishable on the surface. We supply critical new materials that you will still not find anywhere else, which we believe are indispensable in order to effectively 'join up all the dots'. All details about how to enroll are on the Enrollment page, & note that you can enroll & start on any of these courses at any time.